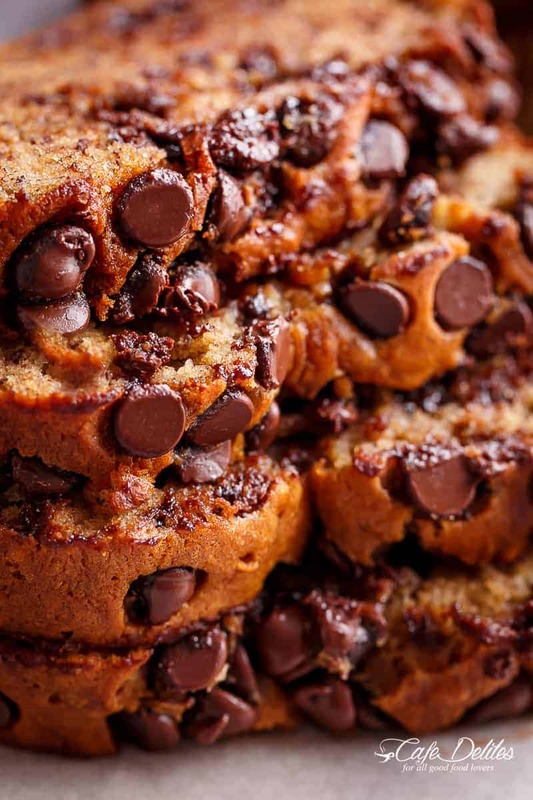 The Best Banana Bread with chocolate chips is so easy and just what you’ve been looking for! Easy homemade Banana bread recipe is not only the best way to use up over-ripe bananas, but it’s possibly the best slice to go with your morning coffee! No mixer needed! Better than anything store-bought, our buttery banana bread is fluffy, soft, moist and smells amazing while baking! Every bite is pure heaven — everyone you serve it to will have a hard time stopping at just one slice. Guaranteed. For the longest time I’ve been wanting to give you all my best banana bread recipe. 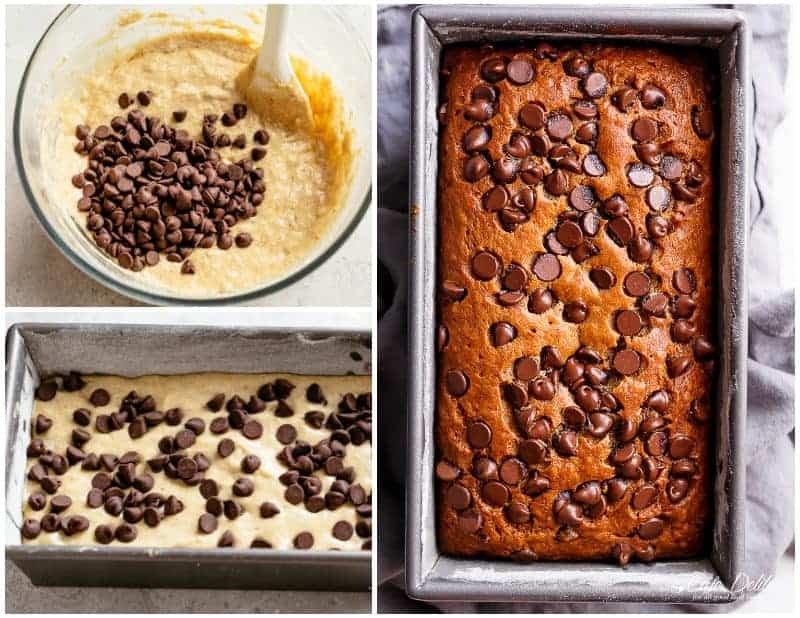 This Banana bread is the most incredible banana bread recipes you will ever try. Quick to make and delicious, it bakes perfect every single time. 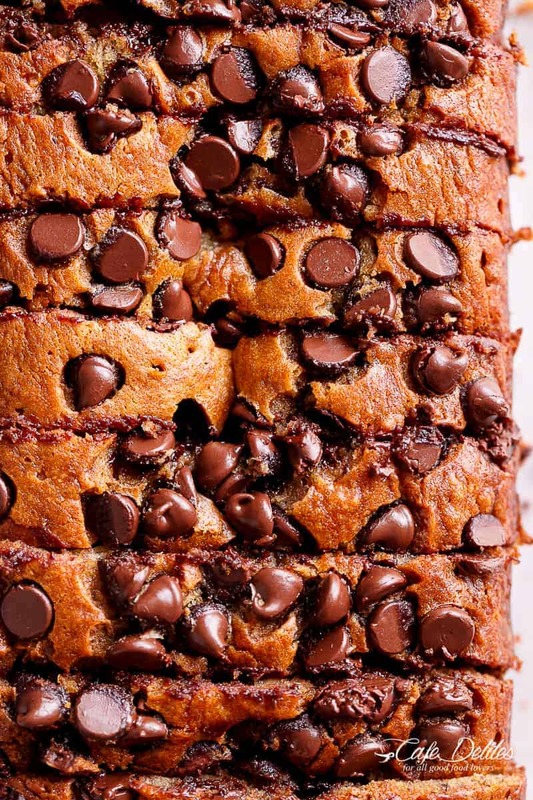 Packed with bananas, cinnamon and brown sugar makes it irresistibly moist! It could not be any easier using ingredients you already have in your kitchen pantry! Enjoy a slice of Banana bread for breakfast with a warm mug of hot cocoa. Or save a slice for a morning or afternoon snack/treat! The perfect way to use up brown, overripe bananas… the easier to mash the deeper and sweeter the flavour. In this recipe, we use 2 different kinds of sugar to yield the best results: brown sugar and white sugar. 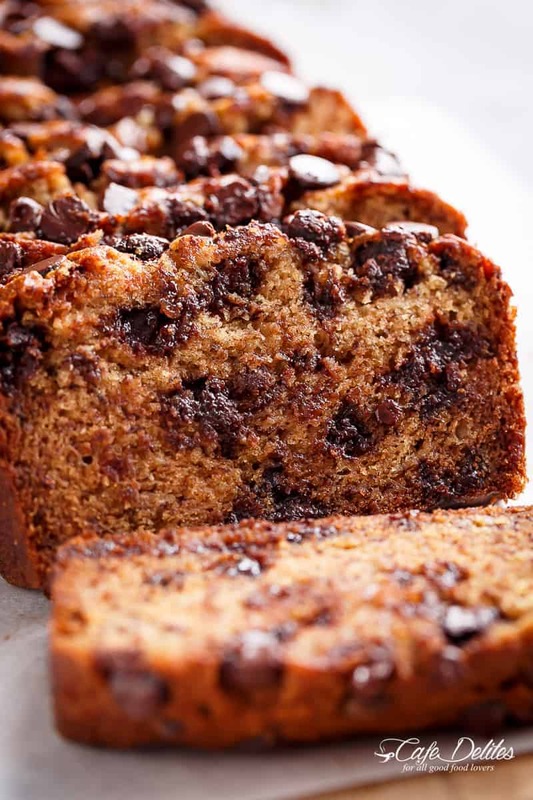 The brown sugar makes for a soft banana bread that you will no doubt fall in love with. MASH the bananas really well. FOLD in half of the chocolate chips or nuts. Start with super ripe bananas with a dark brown peel or black spots. These bananas are soft and full of natural occurring sugars. However, you don’t want them TOO ripe as they will ooze liquid. Mash your bananas well with a fork. It’s fine if there is a few lumps. The batter should be thick and lumpy once all of the ingredients are mixed through. You may be tempted to add more liquid, but you won’t need it. This banana bread is perfect. Do not be tempted to over mix! Use a pale coloured loaf pan — light grey or white is ideal. Dark or black loaf pans are known to darken the bottom of cakes or loaves. Line your loaf pan with parchment paper. Leave a 3 inch overhang to make it easy to pull and lift the banana bread out of the pan. Place your loaf onto a cooling rack to let cool, or enjoy a slice fresh out of the oven! My children can’t stand nuts so we add in semi-sweet chocolate chips to our banana bread, but you can add in the following to make it your own! You can also add a cinnamon sugar coating on top of your loaf and leave out the chocolate chips or nuts if you wish. Once the cake batter is poured and spread into your loaf pan, sprinkle evenly with a cinnamon sugar mixture: 2 tablespoons white granulated sugar and 1/2 teaspoon ground cinnamon. The result is a crunchy, flavourful top with a decadent bakery-style finish. We love cinnamon in this but you could also add nutmeg or all spice. You don’t even need a mixer. Just two simple bowls, a wooden spoon or spatula, a fork and a whisk. The fresh and warm banana bread smell wafting through your house is the hardest part: waiting for it to cool down slightly to serve with little spread of butter. The result? Incredibly fluffy banana bread so tender and moist, packed with buttery richness and delicious depth of banana flavour. This really is one of the easiest baking recipes you’ll use time and time again. Store banana bread tightly sealed with plastic wrap or in an airtight container for up to 3 days on your kitchen counter (if it lasts that long)! How long does Banana Bread last? Up to 3 days at room temperature or 5 days in the refrigerator. Can You Freeze Banana Bread? Absolutely! Freeze the whole loaf wrapped in foil or a large airtight container. OR slice it up and freeze in single-sized portions. When the craving hits, reheat a slice in the microwave for about 20-30 seconds, or defrost it on your kitchen counter first thing in the morning. SIMPLE! 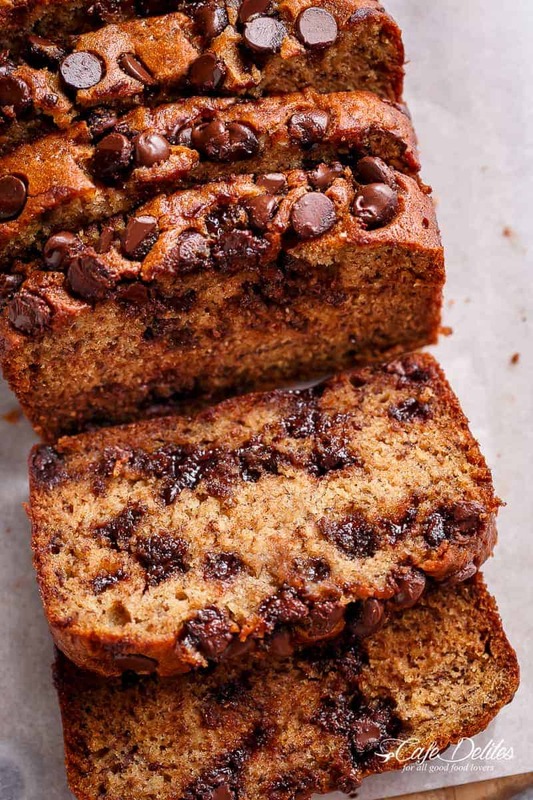 The Best Fluffy Banana Bread with chocolate chips or chopped nuts is not only the best way to use up over-ripe bananas, but it's possibly the best slice to go with your morning coffee! Better than anything store-bought, our banana bread is buttery, moist and smells amazing while baking! Every bite is pure heaven! In a separate medium-sized bowl mash the bananas really well. Then add the eggs, cooled melted butter (or oil), and vanilla. Pour the batter into prepared pan and top with remaining chocolate chips or nuts. Bake for 55-60 minutes, or until bread is golden brown and a toothpick inserted in the centre comes out clean. After about a half an hour, turn out onto a wire rack to cool. I made this bread for a church potluck today, and everyone that ate it, loved it. Some, wanted to take a couple pieces home with them. Thanks for this recipe. Best banana bread recipe ever. I tried several other recipes and they were too chewy. This was perfect when warm or in room temperature. I used oil instead of butter to avoid the slightly tedious process of melting the butter. Wow! I could never make bread that taste like bread…but tonight these came out amazing good. I did use less butter and added unsweetened apple sauce. So moist, my boys had seconds….would of had thirds but this mama said no. This receipe will be saved for the next time. Perfect! Just made this and I have to say, this is probably the BEST banana bread I ever made! Turned out just sweet and moist enough. I tried making this tonight, but I’m not sure why my bread comes out looking white, it doesn’t turn brown or even golden brown …. what am I doing wrong? Can I use a bundt pan for this recipe? Which out of light brown or dark brown sugar work best? I prefer light brown Kayla purely for flavour, but both would work fine! Can I use erythritol instead of sugar and brown sugar? Will baking time stay the same? Hi Sabrina… without testing it I really can’t say. I usually use a 1:1 sugar substitute like Natvia for baking or Swerve. What can I substitute baking soda for in the uk? Will baking powder do? Thank you so much for sharing. I lost my original banana bread recipe some time ago but to tell you the truth you recipe hit the mark 100%. This is my new favorite, my kids LOOOVED it..
Just made this! It’s delicious! 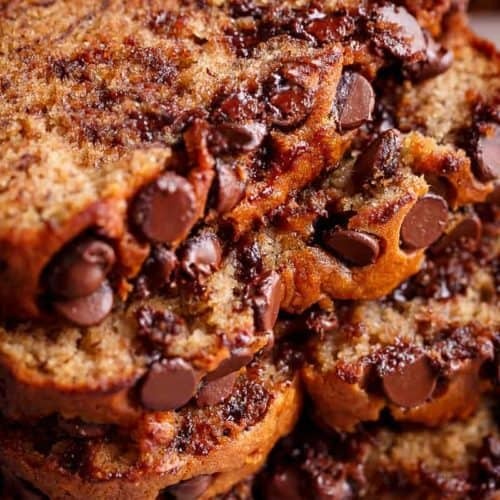 Definitely go to be my go to recipe for chocolate chip banana bread! Odd question but is the 500g banana with or with out peal. Thanks. This is the most delicious banana bread my husband and I have ever eaten! I almost couldn’t stop him from eating the entire loaf. Soooooo yummy! And this is without the vanilla extract and only 3/4 cups of sugar (all brown). Thanks for sharing it Karina… This is definitely a keeper. I’m so happy to hear that Lindy! Hi Katie, that sounds really good! I am glad to hear that you and your son are enjoying these recipes! Feel free to change up some recipes to your liking and diet plans, happy holidays! Made this yesterday and it’s so soft and delicious. I put in a bit of almonds and chocolate chips. Reduced the quantity of white and brown sugar by a bit. I love making banana bread muffins, is there a way to change this recipe to accommodate this? I love the recipe overall though, made my house smell so good! Yes, you are welcome to place them in muffin tins. Just cook them for about 12-15 minutes at 375* depending on how full your pans are. Thank you this was my question as well! I made your chocolate chip cookies last night, they are AMAZING! Thank you Angela we are so glad to hear that! Made this today…so fluffy and moist but i forgot to add in cinnamon! Overall its such a keeper..will definitely make this again with the cinnamon of course! However..i lessened the white sugar to 100 gms and it still taste great. Thx for the awesome recipe! Forgot to rate the record. Five stars from me. I love this recipe! I tried it yesterday, subbed coconut oil for butter and used only 3/4 cup of brown sugar as total sugar content. It was great.Not too sweet and moist. Just made this. Love it! Our family recipe is with dark Chocolate chips and flaked coconut. Yumm!